Bitly (formerly known as bit.ly) is one of the most popular and easiest ways to save, share and discover link on the internet. By using Bitly webapp you can create, edit, manage and share all your website links. Not only that you can visit Bitly on its website, but it can also access it via your mobile device, browser plugin, and many other third-party programs who have integrated Bitly’s powerful service with its public API interface. With Bitly you can shorten long web addresses, analyze online traffic of your brands and products, and increase your productivity. URL shortening and bookmarking service! As of May 6, 2009, Bltly replaced TinyURL as the default URL shortening service on the most popular microbloging social network in the world – Twitter. This enabled Bitly to expand and reach worldwide audience that you will shorty become part of. Try it out! 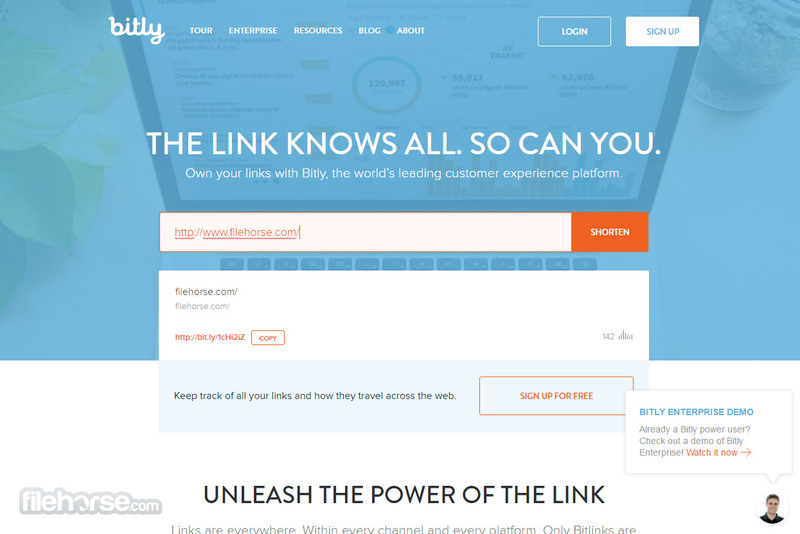 Take complete control over your shortened URL links with Bitly! The arena of URL shortening services appeared out of nowhere in 2002 with the arrival of TinyURL, site whose popularity spawned hundreds of imitators in the short period of time. Now, with the advent of social networks, chat services, and daily sharing of data between almost everyone who uses internet, those URL shortening services have become even more popular. One that managed to become most popular, with reached that made it one of the top 400 most visited websites in the world is Bitly. Created in 2009, Bitly quickly rose to fame as the official URL shortening service of Twitter, the most popular microblogging social network in the world. This exposure enabled Bitly to rise to the top of the URL shortening industry, managing to remain on that place even after Twitter started its own service t.co in late 2010. Today, Bitly remains the largest link-sharing platform in the internet, serving 80 million new links daily and 8 billion clicks monthly. The basic function of Bitly is to quickly and reliably take large inks provided by user and create a redirect link that is much shorter, and therefore more ready to be used on social networks (Facebook, Google+, MySpace), chat services (Facebook Chat, Skype, Google Talk, …), forum discussions and microblogging (Twitter), copied to the user’s clipboard and placed into documents or work projects, and off course, shared with email. Whoever clicks on that short link, it will be automatically redirected to the original long link. To enable easier creating of Bitly links, site offers numerous ways how to do that – via official Bitly website, via several official and unofficial browser plugins and extensions (Chrome, Firefox, Internet Explorer, …), and via numerous apps for both desktop PCs and portable devices such as iOS and Android phones and smartphones. Those apps have direct support for Bitly API, enabling users to shorten their links in mere seconds. URL shortening and bookmarking service! One thing that separates Bitly from its competition is its strong support for statistics, brand tools and various features aimed to allow companies, brands and people to have full insight into their traffic statistics. Bitly interface is modern, nicely designed, with instantly focus on enabling users to quickly create their short link. Main page features single text bar in which you can immediately start creating your own short URLs, while the remainder of main page promotes advanced URL traffic statistic services for personal users, companies and brands. Free users can use Bitly service without any problems, but be aware that you can create your own database of shortened bookmarks organized in directories, if you create free account. Creating new account on Bitly is easy and fast, enabling you to use your Twitter or Facebook credentials to create account in mere seconds, or to take a longer route and provide valid email address. Bitly service is 100% free, without any paid content or premium membership. If you need fast and reliable URL shortening service, look no further from Bitly. With years of experience as one of the most popular websites in the world, But.ly is more than read to increase your productivity by making your links shorter and track your previously shortened links. Try it out! Save any link as a bitmark — articles, images, videos, or music. Instantly search and filter your bitmarks. Organize related bitmarks into bundles. URL shortening and bookmarking service! Share bitmarks via email, Facebook, and Twitter. Invite friends to help curate your bundles. You control the privacy of each bitmark and bundle. Catch what your Facebook & Twitter friends are sharing, in one place. Discover bitmarks from around the web recommended just for you. Come across something neat? Save it!